6th Place: Another finish in the money made the crowning of John Gipson, Jr., and Tom Noe as the 2015 Season Champions official. This time a 10.88 pound limit won them $136. 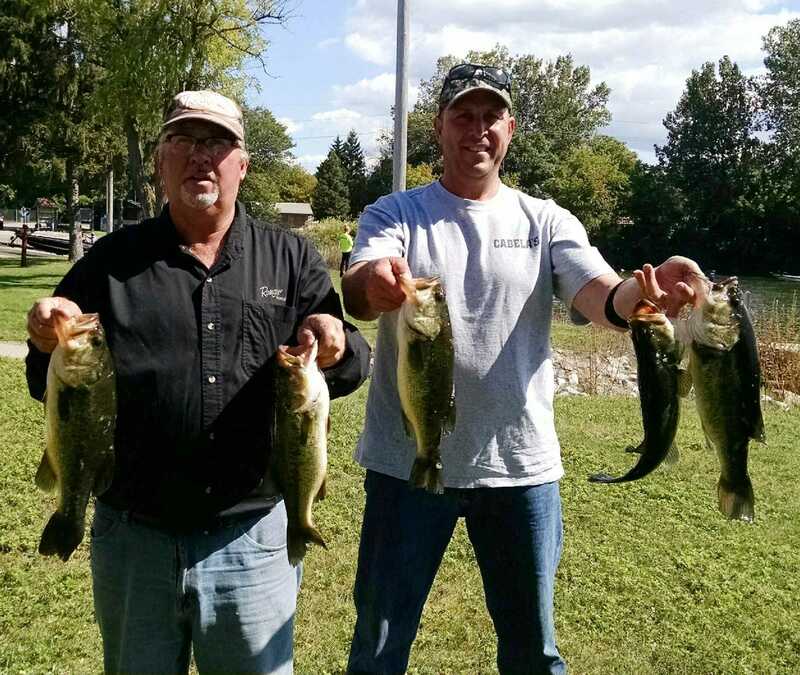 7th Place: A 10.45 pound limit won Bob Bruick and Aaron Krider (left) $113. 8th Place:Steve Prange and Josh Stalcup needed only three fish to finish in the money. They weighed 9.17 pounds and won them $91. 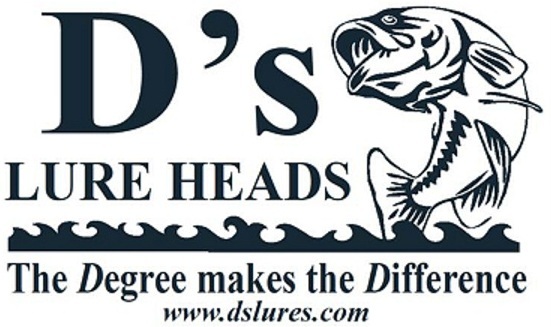 D's Lures Award: An 8.59 bag of fish won Brody Solmos and Kevin Knape a package worth over $50. 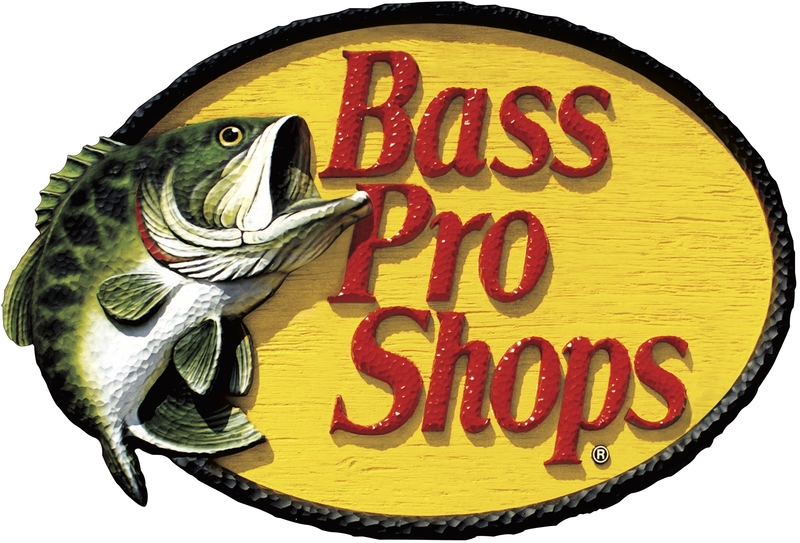 Bass Pro Shops Award:Jonathan Painter and Jake Lisenko finished 15th place with 7.17 pounds and won a Pro Qualifier reel provided by the BPS store in Portage, Indiana. Solar Bat Sunglasses Incentive: Finishing in 20th place with 5.60 pounds, Kevin Fletcher and Pablo Gonzalez qualified for the Solar Bat Incentive worth $100 in cash. Make sure you are qualified! 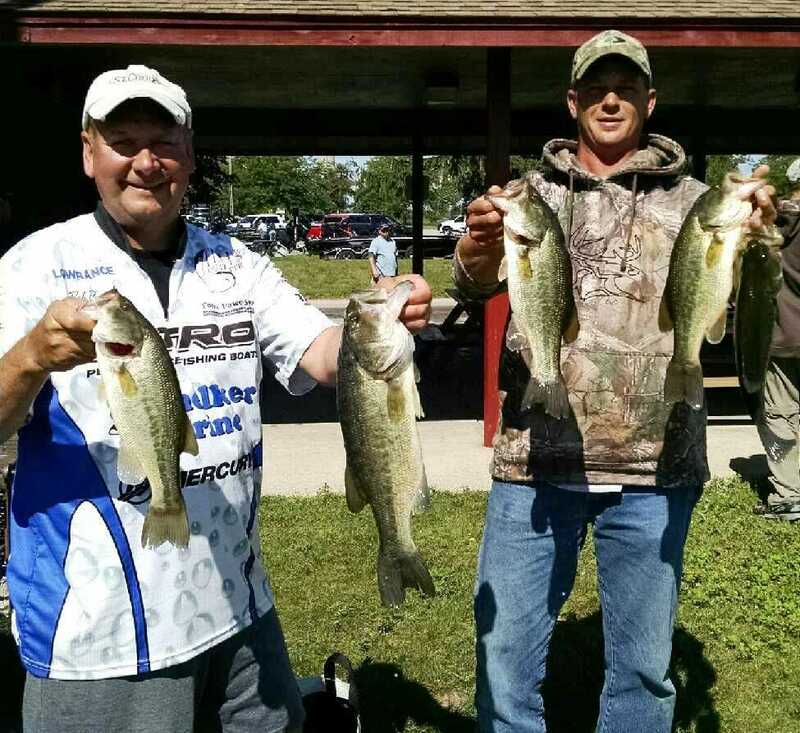 1st Place: After chasing one for five years, Steve Kline and Mark Farver finally landed a victory in the R & B Bass Circuit. They have won events in nearly every other circuit in Michiana, but the R & B has eluded them despite numerous top 5 finishes. This time no team could topple their 14.56 pounds. "It just feels great," admitted Kline. The day before the event the team had success by tossing a slew of vertical baits: jerkbaits, crankbaits, swimbaits, and the Alabama rig. However, the next day during the tournament, they could not fool a fish with these baits, so they made a critical switch. They switched to a horizontal bait: the jig. 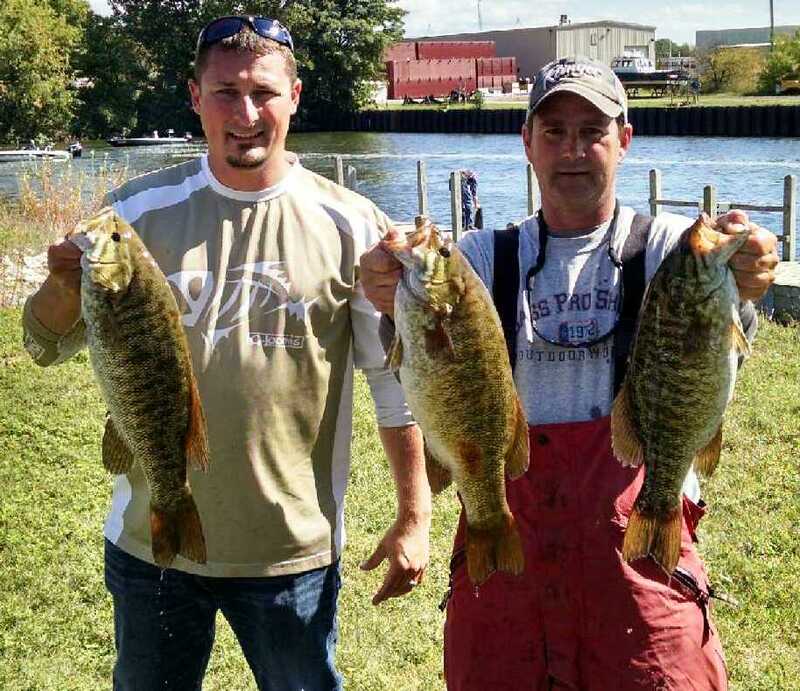 2nd Place:The North Liberty, IN team of Jason Dittmar and Tony Kaser brought a limit of smallmouth from Muskegon Lake that weighed 14.28 pounds to win $454. They slung a combination of C Flash crankbaits in the bluegill color and D's Lures tubes in the green pumpkin color scheme in water between 12-15 feet deep. Seven total keepers fell victim to their presentations. 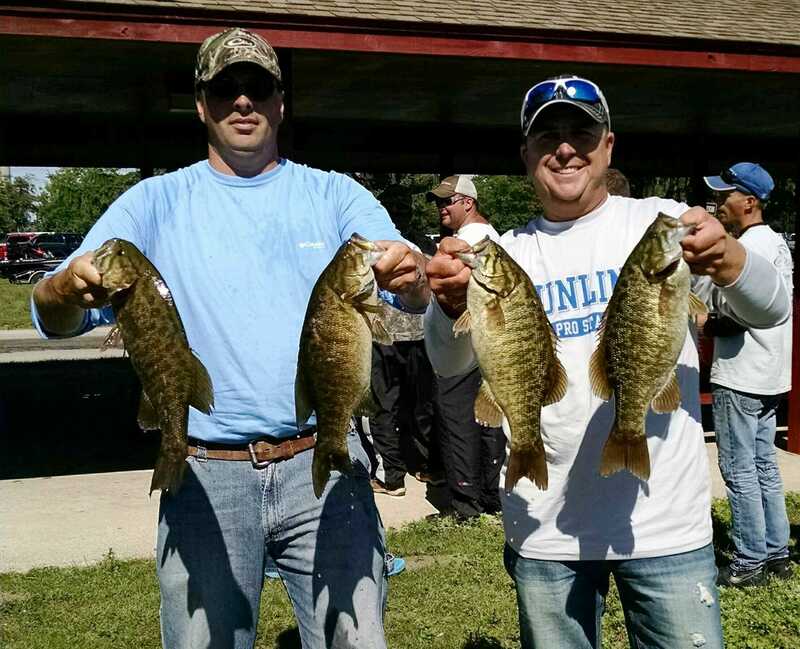 4th Place: Teamed up with substitute partner Mike Henderson, Trevor Paulus landed three smallmouth bass in the first 30 minutes of the tournament that weighed 12.09 pounds, which was good enough to claim $227. On top of the high finish, they also brought the biggest fish of the event to the scales - a 4.91 pound smallmouth, which won them another $344. The team used drop shot rigs matched up with finesse worms in 15 feet of water to fool their fish. They never landed another fish after their early morning flurry. 3rd Place: For the second consecutive tournament, Doug Roher and Dan Frederick settled in third place. This boosted their standings to be the last team to qualify for the Classic at Coldwater Lake. 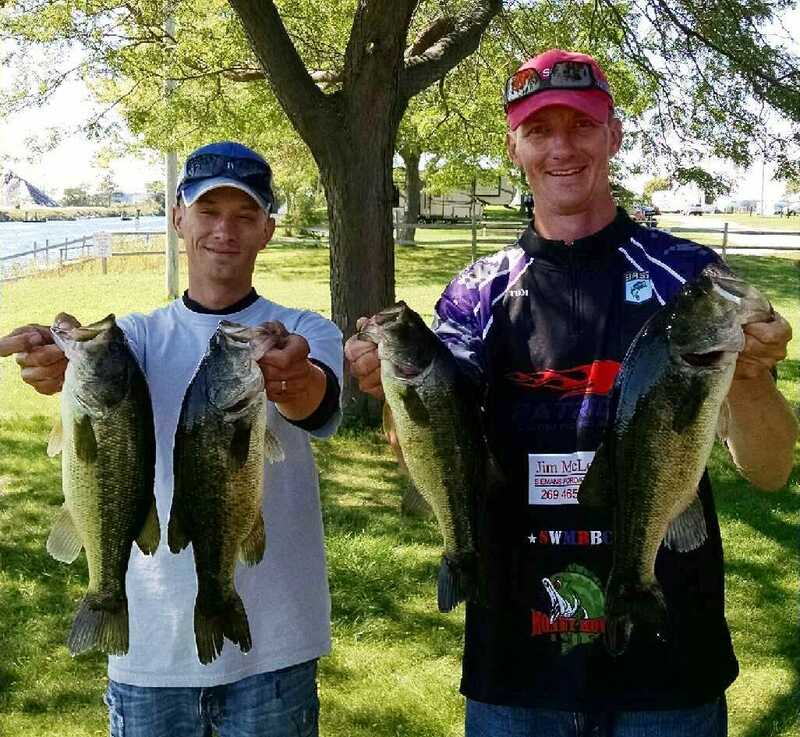 Three spots on Muskegon Lake produced ten fish, eight being keepers. These spots were found in practice and had baitfish prevalent and only between 3-5 feet deep. 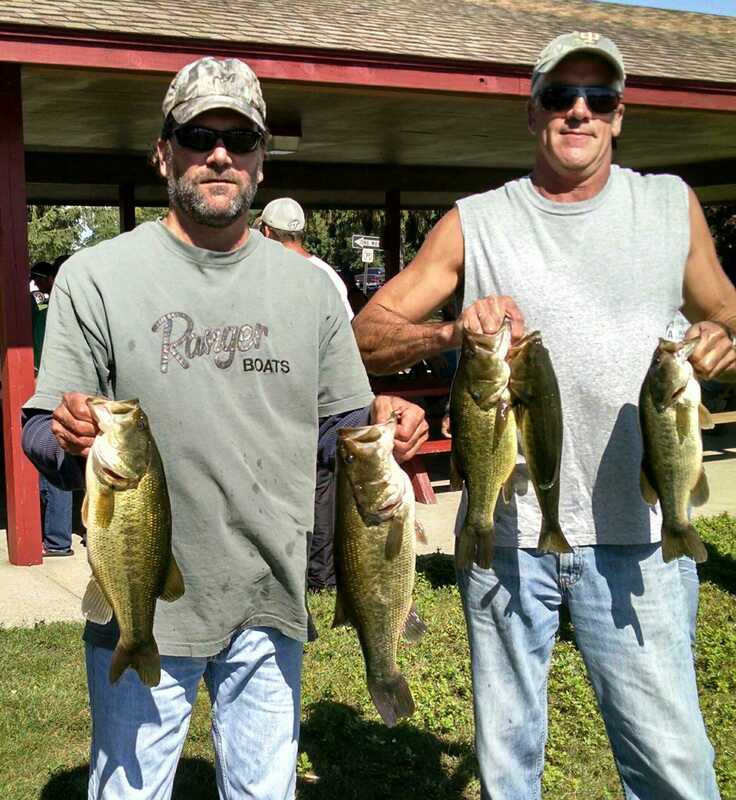 Most fish were caught before noon, "The morning bite was good, but the afternoon bite slowed down tremendously," admitted Frederick. Their 13.82 pound limit, which included the second heaviest fish of the tournament, won them $340. The big fish scored them another $86. Their black/blue, 3/8 ounce jigs were worked around wood between 11-12 feet of water. They landed three keepers in the first 30 minutes, but then struggled to keep it going. Through the day, five different spots produced 1-2 fish and eight were keepers. The victory sent $748 home with them, and they now have that coveted R & B Bass Circuit on their resume. 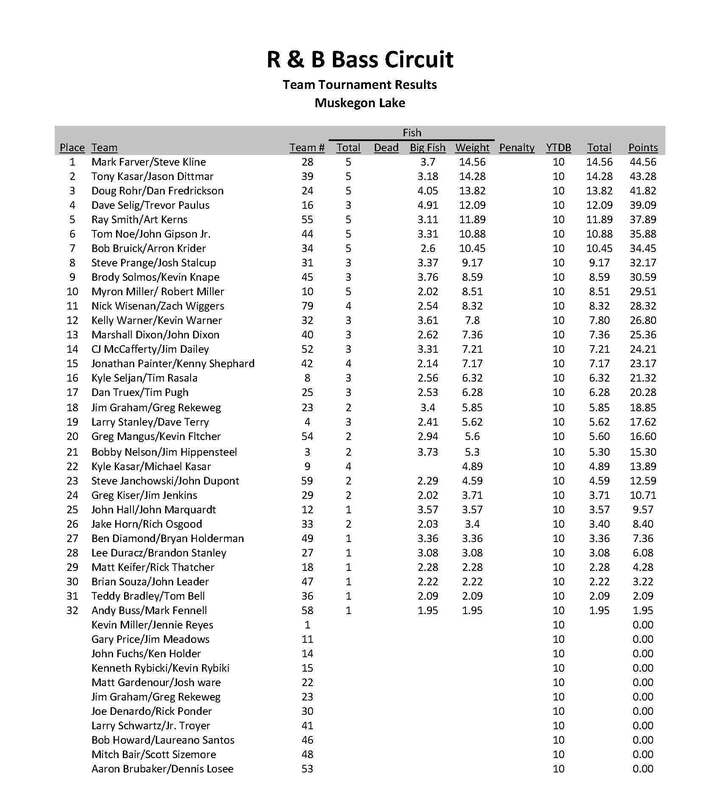 5th Place: Art Kearns and Ray Smith logged their first top 5 finish with the R & B Bass Circuit by landing an 11.89 pound limit, which came with $159. 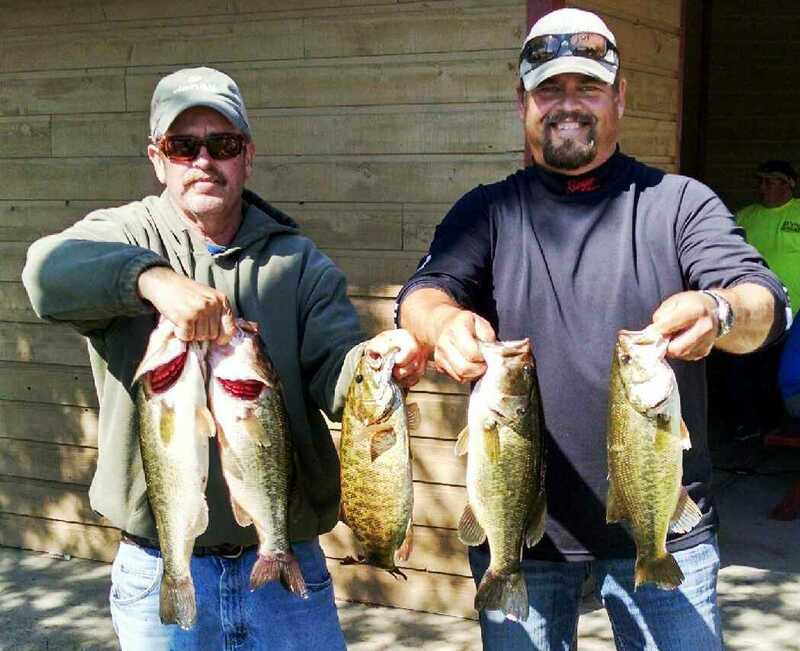 Two baits produced their five keepers in just the first 90 minutes of the tournament. Smith explains, "We got one almost right away on a pop-r and got three more on a green structure jig. We got our final keeper on a top water too. All of our fish came from a single 100 yard stretch. This stretch had sharp break from 2-10 feet, and also possessed a mix of rock, weed, and wood.